Hello everyone! It's the last Monday AND the last day of June (shaking my head wondering where the month disappeared to)! So, it's time for a tall and skinny Mojo Monday sketch challenge and I went with a 3 1/2" x 5 1/2" card size again. I normally don't send out 4th of July cards, but thought it's time I changed that routine, so paired it up with a thinking of you sentiment for my dad who lives out of state. I'm sure he'd like a little happy mail in his box! STAMPS: American Hero and Take Note - both by Verve. PAPER: Yankee Doodles 6x6 pad by We R Memory Keepers, Night of Navy, White. ACCESSORIES: Star border Die-Namics by MFT, Stitched star and stitched circle dies by Lil Inker Designs, Clear sequins from Avery Elle's Winter Blend package. There's a new Tag...You're It! challenge blog started by Jackie Blackwell and the first post is a mini challenge based on this inspiration photo. How ironic that I'm in the process of packing for a beach vacation coming up before long, so I couldn't resist playing along! I was also inspired by Naomi Witzke's adorable card HERE that I came across on Pinterest. Every bit of paper on my tag was taken from my scrap pile! I tore 3 different shades of blue (I'm guessing it's Soft Sky, Pool Party and Bermuda Bay) and punched the flip flops out of a textured cardstock (? Bazzill). The "towel" was dry embossed using SU's Square Lattice embossing folder. 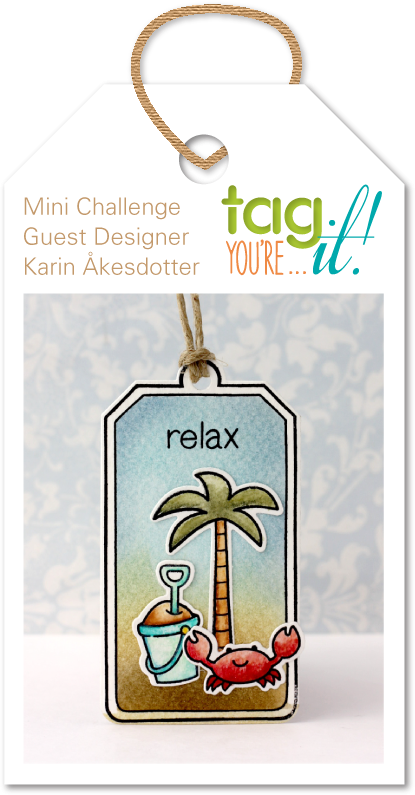 I love that the challenge is for CAS tag designs! So often, I see really complex tags created and I cringe at the thought of the recipient trashing it as soon as the gift is opened! With CAS designs, there's much less cringing going on - lol! This was also the first time I used this bargain bin flip flop punch by EK Success. How sad is that?! Especially since I've had it since end of last summer! 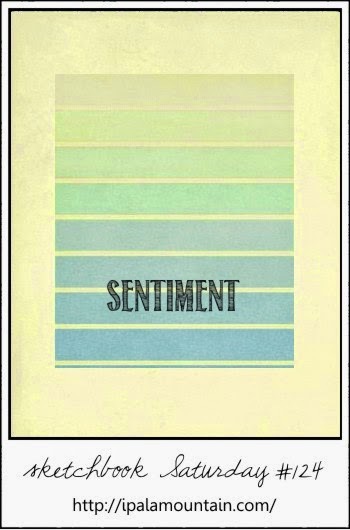 The "happy" sentiment is from MFT's Accent It - Celebrate Die-Namics and the tag base is MFT's Traditional Tags STAX Die-Namics. Thanks for stopping by...appreciate all of your comments! 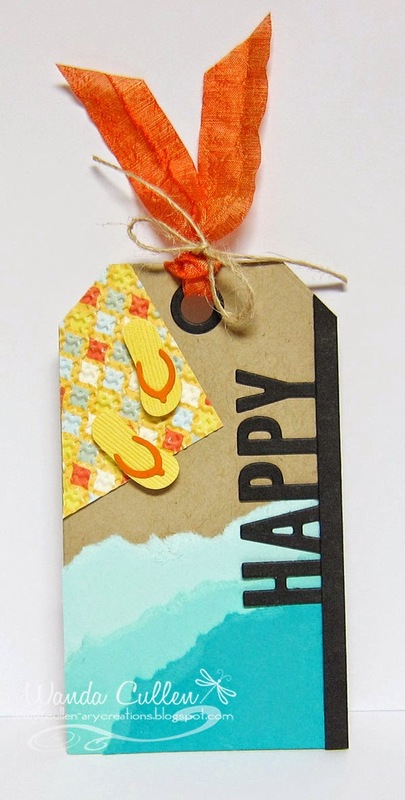 Wendy has a fun Free 4 All challenge on SCS today - a theme to use something you love about summer! There's nothing more refreshing than a really cold, sweet watermelon on a hot day! 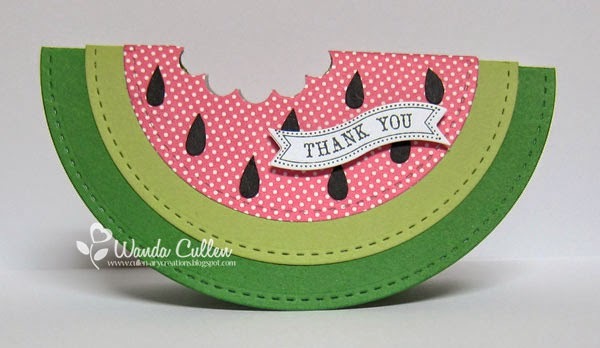 I saw some watermelon shaped cards on Pinterest and decided to try my hand at one. I used the 3 largest circles in Lil Inker Designs' stitched circle dies. I folded each one in half then punched the "bite" in the polka dotted circle. 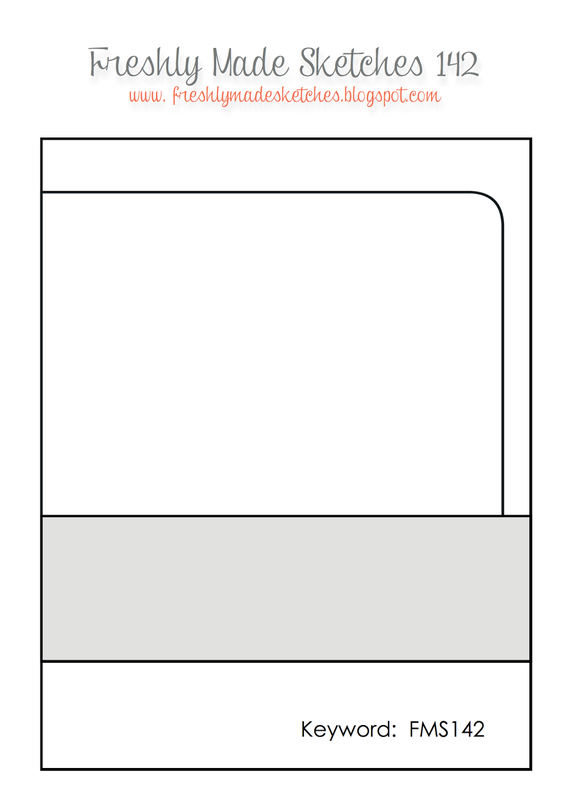 The heavier cardstock layers were too thick to punch, so I outlined the "bite" with a pencil then cut out the area with a scissors. The seeds are halves of the smallest heart punch...cutting them in half and rounding the edges a bit. A quick itty bitty banner sentiment and this fun card was completed! 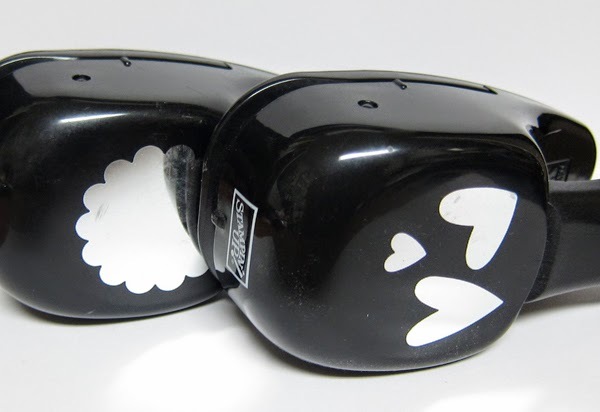 ACCESSORIES: 1 3/4" scallop circle punch and heart trio punch - both by SU. Stitched circle dies by Lil Inker Designs, Itty Bitty Banner Framelits by SU. 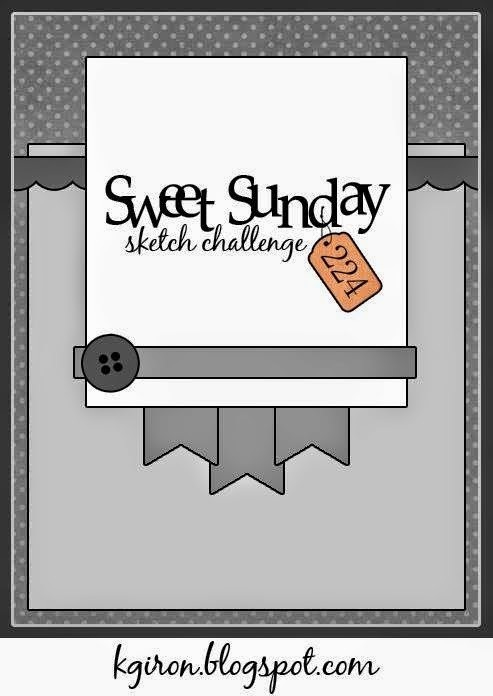 Jen B has a great new layout for the Freshly Made Sketches challenge! I finally broke into a pack of Bazzill 6x6 papers with all black and white patterns. Love to add a pop of color to black and white - always a clean and classy card look IMO. I die cut the sunflower and leaves from Canson 90 lb. watercolor paper then stamped with Tim Holtz distress inks. For the flower, I stamped on Mustard Seed first then patted some Spiced Marmelade around the edges. I spritzed one time with a light mist of water and stamped it. For the center, I stamped Rusty Hinge then Brushed Corduroy. Peeled Paint ink was used on the leaves. By misting the image, it gives it a water colored appearance. I finished it off with this fun font sentiment by Simon Says Stamp. 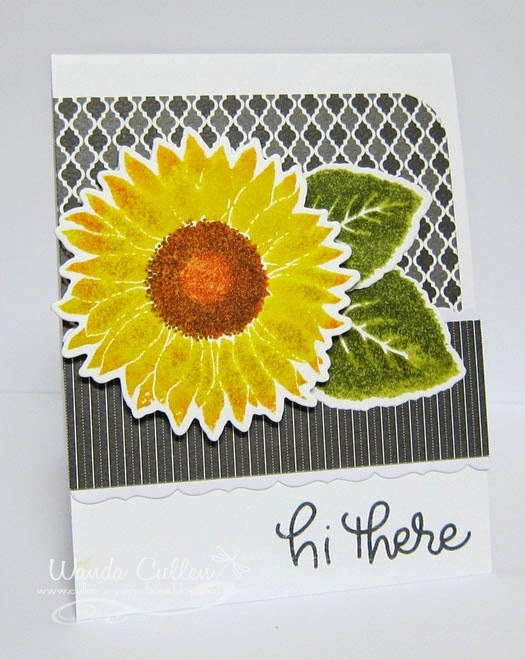 STAMPS: Splendid Sunflower (My Favorite Things), Stripe Greetings (SSS). PAPER: Licorice 6x6 pad (Bazzill Basics Paper), White (PTI), Canson watercolor paper. INK: Black Licorice hybrid ink by MFT, TH distress inks (listed above). 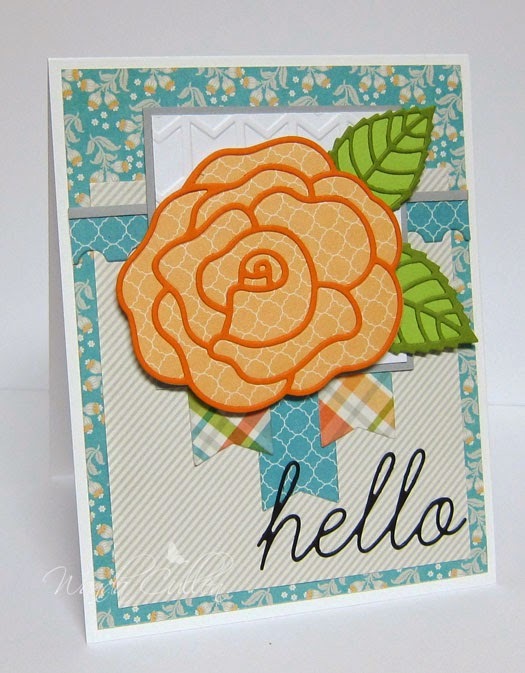 ACCESSORIES: Corner chomper, Border Die-Namics by MFT, Splendid Sunflower Die-Namics by MFT. 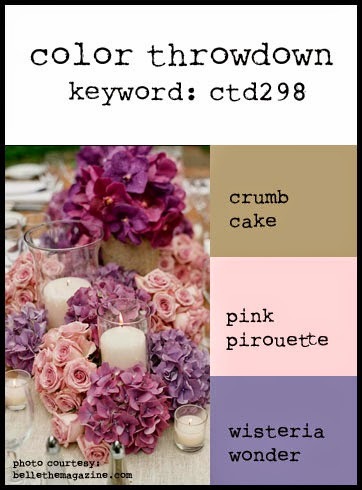 It's hump day and it's a new Color Throwdown Challenge day! For me, it might be ejection day since I simply couldn't resist sneaking in some green leaves on my mixed media card. Leaves don't count...right? Monika has this awesome table arrangement for our inspiration...just gorgeous! With Cindy's wedding cake last week and Monika's table decorations this week...we are ready for someone to tie the knot! I'm also playing along with a new challenge - Mixed Media Mojo - and their first challenge was to use stamps and at least two different mediums. I ended up with more than two mediums: modeling paste, watercolor pencil splatters, Stickles, burlap, jute twine, distressed crimped frame, paper. Guess I'm really in a rebel mode - lol! Play along with us this week and you just might be in the spotlight next week by being our guest star stamper! You don't have to have exact colors to play along, but you do need to have a close resemblance. 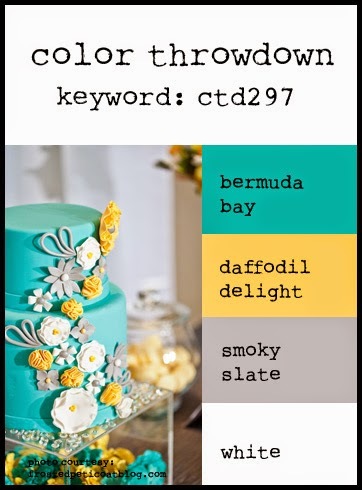 Be sure and link your creation to the linky tool at the bottom of the current challenge post on the Color Throwdown blog. 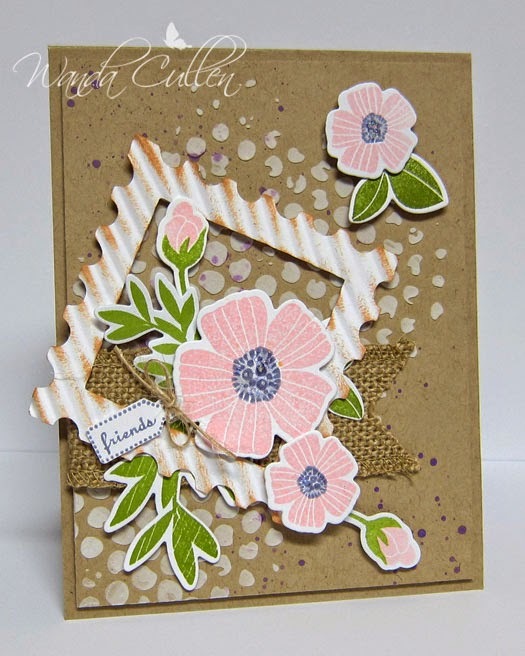 ACCESSORIES: Spring Bloom dies by WPlus9, Burlap ribbon (SU), Jute twine (May Arts), Light modeling paste by Liquitex, Bubbles stencil by Tim Holtz, SU watercolor pencil, Diamonds Stickles, Crimper. nearly covered the square panel and didn't allow me enough room to add the one strip w/button. I'm thinking I need to try this again with a smaller focal point - lol! Papers are from MME's A Mother's Love 6x6 pack - some of my fave colors! No stamping on this one...just lots of dies. ACCESSORIES: Hello die by Memory Box, Flag banner die by Reverse Confetti, Layered Leaves and Rose with Overlay Die-Namics by My Favorite Things, Arrows embossing folder by SU. 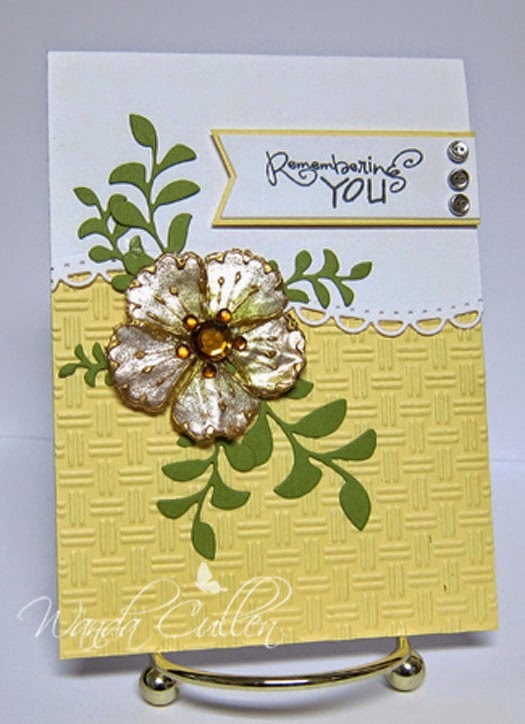 A quick and easy card for the Color Challenge on SCS: Cherry Cobbler, Pumpkin Pie, and Daffodil Delight. The dessert option is to choose any 4th color of our choice. That was easy...I needed a green for my leaves in this fun new SU set - Kinda Eclectic - the first one I ordered from the new SU catalog. I stamped the dots twice with one inking so that it would have an ombre look. The leaves were fussy cut after I stamped them in Lucky Limeade - my color of choice. sketch (aren't they all?!) by Julee! 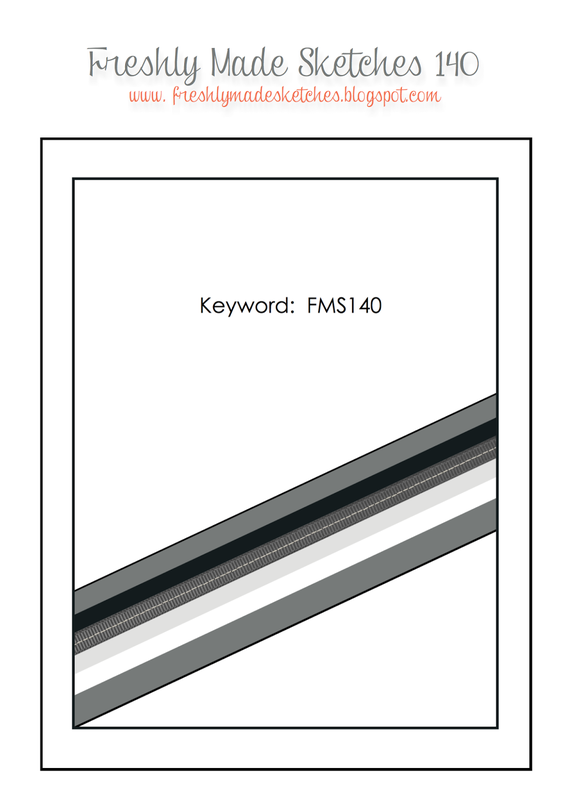 Recently I used some of this designer paper pack on a card and didn't know the source. A kind blog reader informed me it's retired DP by SU called Watercolor Wonder - thanks to Heidi Weaver for letting me know! I'm sad that it's no longer available since the watercolor craze has hit me big time, but it's inspired me to think of recreating some of the same patterns on my own. The doily circle is a tag by Martha Stewart and since there were circles in the paper, I thought these poppies would tie in nicely! STAMPS: Poppy Birthday (Verve), Better Together (Verve) - chevron border, Remember This (Verve) - sentiment and flag stamps. PAPER: Watercolor Wonder (SU), White (PTI). INK: Lucky Limeade, Old Olive, Crisp Cantaloupe, Black Licorice hybrid ink by MFT. ACCESSORIES: Lace trim, MS tag, Black Enamel Accents, Build a Poppy dies (Verve). A quick CAS creation for the Viva la Verve Challenge for Week 3 posted yesterday by Chaitali. She has a clean, simple layout with a wonderful inspiration photo that inspired me to use some metallic elements (brads and flower). The tablecloth pattern inspired me to use this basketweave embossing folder by Lifestyle Crafts. The curved border was cut with an A2 Curved Borders One by Spellbinders. 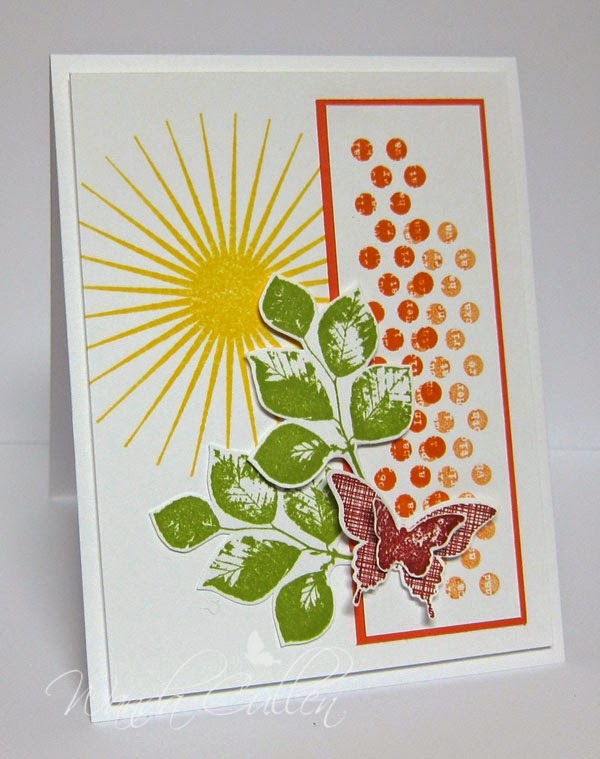 The sentiment is from Verve's Poppy Birthday stamp set and the leaves are their new Sprightly Sprigs die set. Today, we're taking a look back at the great June release at ODBD! 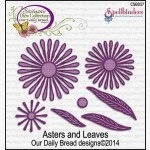 I wanted to use the Asters and Leaves die set for a white on white creation with a tiny pop of yellow. The sentiment is from the newly released Cherry Blossom stamp set. 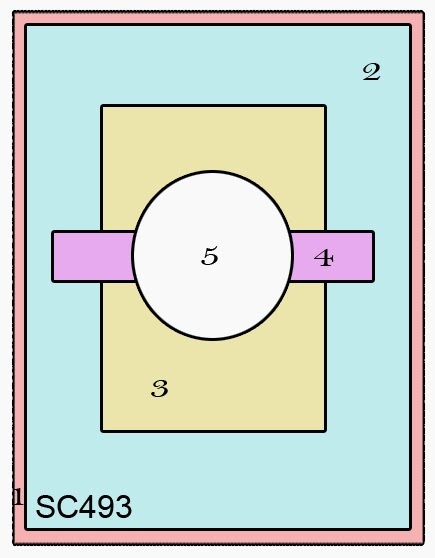 I thought the Daisy Chain background die (from an earlier release) was a good match for the other elements. I used lots of foam dots to pop the different layers for added dimension. 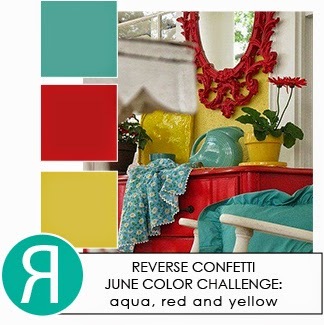 I love this trio of fun summertime colors in the Reverse Confetti June Color Challenge! I used the layout for the current Sketch Challenge on SCS. Designer paper is from MME's On the Sunny Side 6x6 pad and what I thought was a red dotted panel now looks more orange in this photo. :-( I always have fun arranging the posies from RC's Petals 'n Posies stamp set! The banner is from RC's Beautiful Banners and the sentiment is from their Peacock Pretties set. INK: Pool Party, Real Red, Daffodil Delight - all by SU, Black Licorice (MFT). ACCESSORIES: Stitched circle die by Lil Inker Designs, Beautiful banner die by Reverse Confetti, Petals 'n Posies dies by Reverse Confetti, Enamel dots by MME. 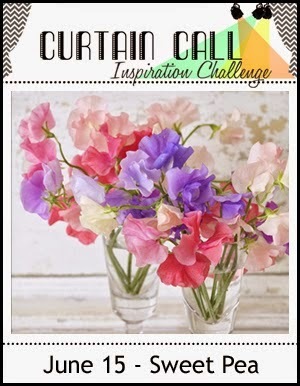 Stacy's Curtain Call Inspiration Challenge - Sweet Pea theme. I have a gazillion flower stamps but couldn't find any sweet peas. Instead, I was inspired by the colors and the idea of cut flowers in a vase. The jar is from a Flourishes set called Garden Picks and the remaining flowers and leaves are from WPlus9. STAMPS: Garden Picks (Flourishes), Spring Blooms (WPlus9), Fresh Cut Florals (WPlus9). INK: Tim Holtz distess inks: Tumbled Glass, Peeled Paint, Peacock Feathers, Spun Sugar, Picked Raspberry, Shaded Lilac, Dusty Concord, Mustard Seed. ACCESSORIES: Hand Lettered Hello die by WPlus9. Check out these gorgeous summertime colors picked by Cindy for this week's Color Throwdown Challenge! I went with a freestyle grunge theme and mixed quite a few stamps from 2 different companies to get the job done. I want to give a shout out to this week's guest star stamper - Pat Knowlton! Be sure and visit her blog HERE. Play along with us this week and you just might be in the spotlight next week by being our guest star stamper! You don't have to have exact colors to play along, but you do need to have a close resemblance. Be sure and link your creation to the linky tool at the bottom of the current challenge post on the Color Throwdown blog. ACCESSORIES: Enamel dots (MME), Whole Lotta Happy and Happy Trio dies by WPlus9. 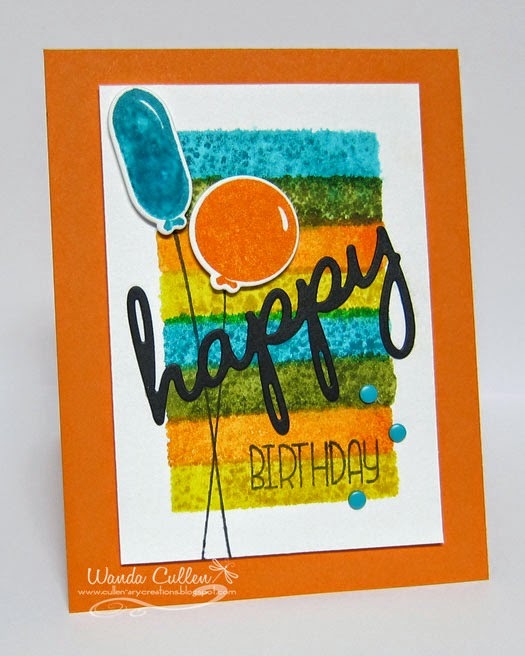 Vicki has some great summery colors on the SCS Color Challenge: Tempting Turquoise, Pool Party, Garden Green. I wanted to practice watercolor wash backgrounds, so chose distress inks that were similar in color. 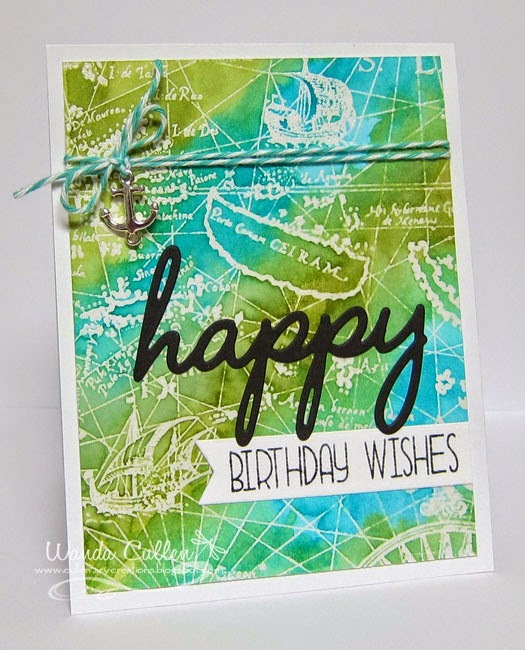 The colors reminded me of the sea, so I went with this retired Old World Map stamp by SU and stamped in Versamark, then embossed with clear EP. My new love is the Happy Trio dies by WPlus9...so easy to add a bold sentiment without covering up much of the background! There you have it...a masculine birthday card that's quick and easy! STAMPS: Whole Lotta Happy (WPlus9), Old World Map (SU). PAPER: Ranger watercolor sheet, White, Black. INK: Peacock Feathers, Tumbled Glass, Peeled Paint by Tim Holtz, Black Licorice hybrid ink for the sentiment by MFT, Versamark. The CAS challenge on SCS is to CASE something from Harriet Skelly's gallery. She excels at CAS designs, and I had a hard time choosing, but finally went with her mixed media creation HERE. I had already had this stenciled base made from a previous play day, so it was really quick and easy to add a die cut sentiment and butterfly embellishment and call it done! The dots (Dylusions) were stenciled using Sahara Sand ink then layered with metallic gold texture paste (Wendi Vecchi) and a burlap stencil (Tim Holtz). 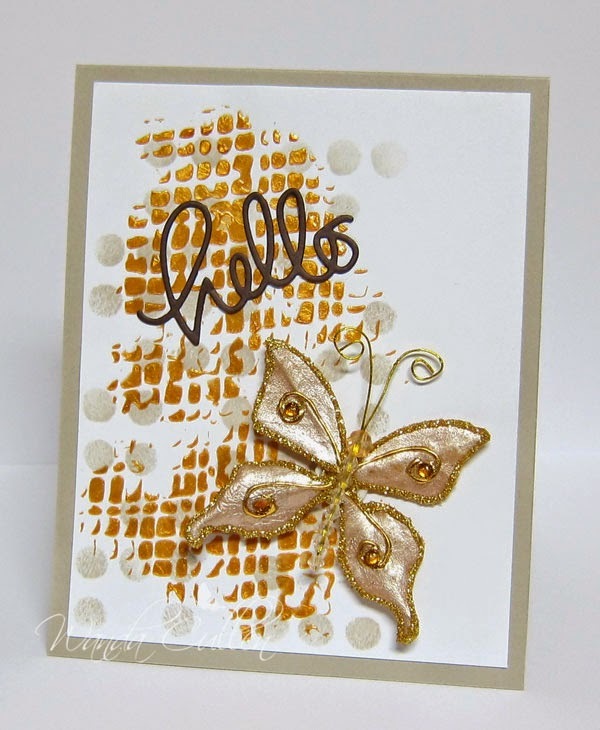 ACCESSORIES: Natural skeleton leaf butterfly by Recollections, Small hello die by Simon Says Stamp, Dylusions Dotted Flower stencil, Tim Holtz' burlap stencil, Wendi Vecchi metallic gold texture paste. 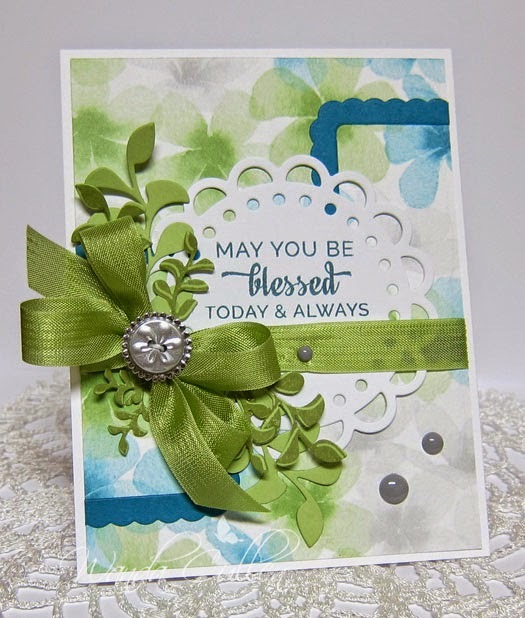 ACCESSORIES: Sprightly Sprigs die (Verve), Rounded Scallop Frame die (Verve), Doily Die-Namics by MFT, Pear Pizzazz seam binding by SU, Silver button by Jolee's, Enamel dots by MME. on Tim Holtz' Peacock Feathers, Peeled Paint, Spiced Marmalade, and Mustard Seed ink pads, misted lightly with water and stamped on Ranger watercolor paper using the smooth side. I dried it after each "stamp" using a heat gun. Balloons were stamped on die cut shapes then popped with foam tape. Perfect for another masculine birthday card needed this month! Loved the easy sketch in Chupa's Sketchbook Saturday Challenge #124. 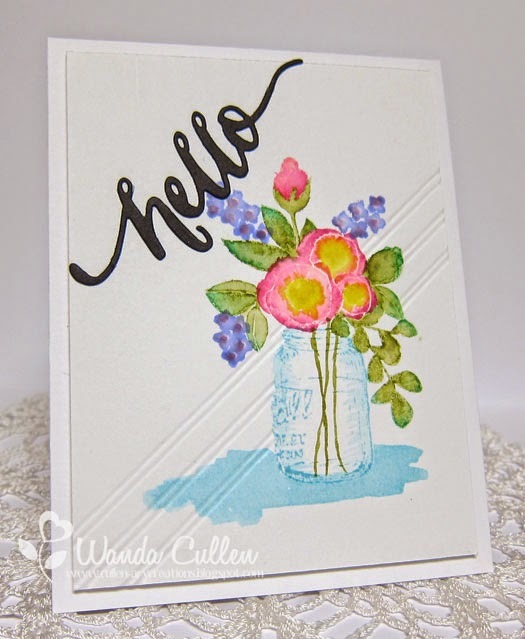 I'm also CASEing today's Featured Stamper - Maura (aka beesmom) - on SCS with her card HERE for inspiration. 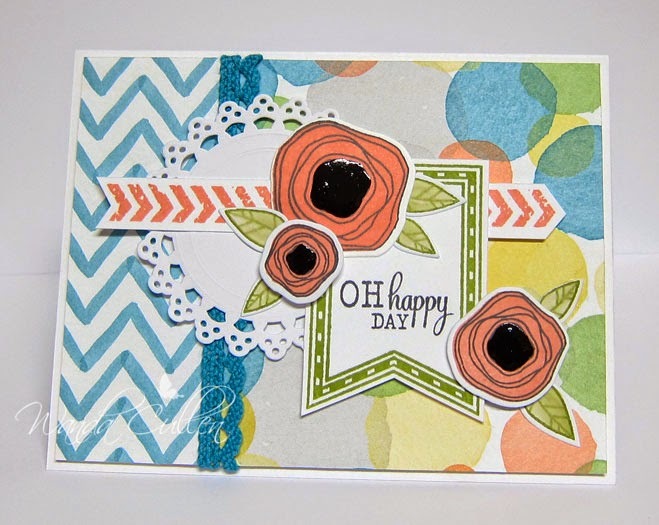 ACCESSORIES: Whole Lotta Happy dies and Happy Trio dies by WPlus9.